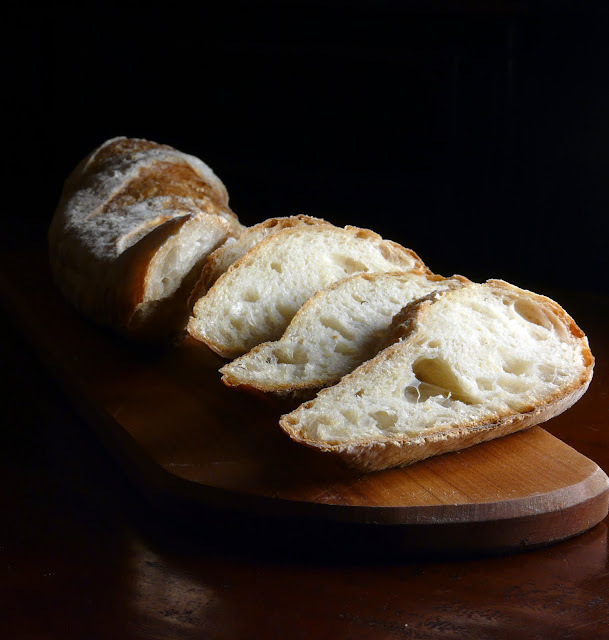 A biga made with 2 oz of just-fed sourdough starter was mixed up Sunday night and Monday morning it was added to 4 cups of flour with just an 1/8th of a teaspoon of yeast. 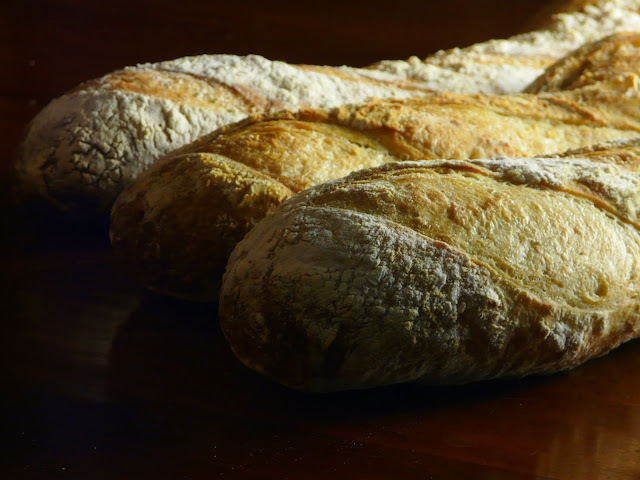 The starter is strong enough to make bread without the addition of yeast but according to Amy Scherber of 'Amy's Bread' most commercial bakeries add a small amount of yeast to their dough for consistency. Sometimes I do and sometimes I don't. The dough was allowed to double once, knocked down and refrigerated until Tuesday morning. The dough needed about three hours to come to room temperature before it was ready to shape. This batch 1 1/2 cups of biga plus 4 cups of flour made 3 large loaves. The bread has a nice mild but definitely sourdough flavour. I prefer it mild but if I was making it for my son I would have left the dough to develop an extra day to intensify the sourness. This dough also makes the best pizza crust. If you are interested in developing your own sourdough starter I can highly recommend the one from Amy's Bread. This starter is begun with rye flour because rye just LOVES to ferment and is an easier starter to get going than a wheat starter. When I first made it, it had a bubble or two within a couple hours. The procedure is to start it with rye flour, then transform it by changing what you feed it. The original rye will dilute to nothing over time and you'll end up with a white flour (or whatever other grain you choose, it could be whole wheat or pumpernickel, or you could leave it as a rye starter) and water based starter, but it had the advantage of beginning it's life from highly fermentable rye flour. Start it with organic rye flour and spring water. Once you have it going well you can switch to all-purpose white (or other) flour as you choose. The use of spring water is recommended for maintenance, however, as tap water may contain elements (such as chlorine) which may be detrimental to the health of your starter. I also recommend that you use a container that you can mark the volume levels of starter each time, so that you will know when it has doubled. Use a marking pen or tape or any other means to indicate on the container the starter levels each time you feed. Phase 2 - Stir the culture down, notice how soupy it's become. The batter should have a noticeable sour smell & a mildly tangy taste at this point. Add 2 oz water & 2 oz flour and stir vigorously until well-combined. Let it sit for 12 hours. It should be showing a fair amount of activity at this point. You should see lots of foaming & bubbling through the sides as well as on the top. Don't be concerned if the culture deflates & loses volume. This means the yeast has exhausted its food supply, but it will continue to increase in acidity. Don't worry if your culture isn't dramatically active yet. As long as there is some noticeable activity going on and the mixture smells & tastes sour, you're on the right track. Phase 3 - The culture should now have a pronounced, sour, fruity taste and smell, it should not taste musty or bitter (if it does, discard and start again, paying close attention to the temp of the culture at all times). Now you can start "transforming" it into a white (or other) flour based starter. Use 6 oz of the starter, add 3 oz water & 3 oz flour, stir vigorously. Let it sit for 12 hrs at 75 - 77 degrees F.
Refresh it again, setting up a maintenance level of 12 oz of starter. This will be your "mother" starter that you use to build the sourdough starters/sponges needed in individual recipes. Each time you take part of the mother out to build a starter, you must refresh it with equal weights of flour and water to bring it back up to its maintenance level. To maintain - Use 6 oz of the mother culture (discard the rest), add 3 oz water & 3 oz flour, stir vigorously, let it sit at room temp until doubled in volume. A strong mother will double in 8-12 hours. If yours doesn't do that, let it continue to sit out until it has a nice tangy taste and smell; discard all but 6 oz and repeat this procedure. Repeat this procedure as many times as necessary until the mother doubles within 8-12 hrs. It may take several days. Don't get discouraged, it's worth the effort. To use for recipes - Combine 1/2 c (5 oz) Mother from the refrigerator, add 3 oz flour and 2.5 oz warm water (85 - 90 degrees). The mixture will be stiffer than the mother. Let it sit, covered, until doubled in volume (if it doesn't do so go back to maintenance procedure). When the starter has doubled, it is ready to use in a recipe. Measure the amount needed and discard any that remains. My Notes: Make a Biga using 2 ozs of Sourdough starter, 1 1/2 cups of flour and one cup of water. Mix well , cover and allow to sit overnight. Add four cups of flour and enough water to make your dough and one tablespoon of salt. I'm going to really read this when I have more time because for a long long time I've wanted to make a starter. I think what has always thrown me is the phrase "feed the starter". My synapses must not be snapping because that just doesn't register with me. Anyway, as I said, I have questions. I hope that you won't mind my asking then when I finally get them formulated in my head. Linda go for it. It really is quite simple. Basically just water and rye flour. Katy, I'll be happy to answer any questions you have. You will be surprised at how easy it is to grow a starter and keep it going. Your bread is a work of art! What a beautiful sourdough. I have been working towards making a bread like this and hope it turns out half as nice! oooh "lots of crevices to hold the butter!" Great for me because I tend to slather on the butter. 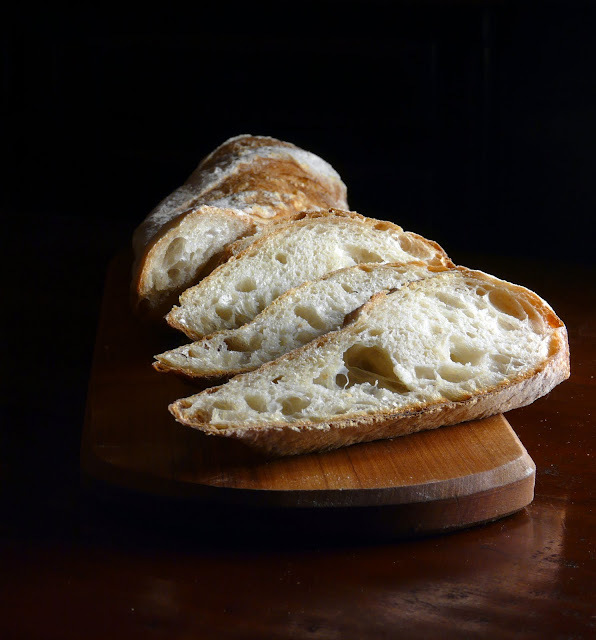 This is the first recipe for a sour dough starter that's made sense to me. Maybe it's because I've been experimenting with a pre ferment the last couple of loaves and I'm beginning to relate the concept and it doesn't seem so Greek to me now! Your bread looks wonderful, exactly how I want to make it. I think I want to play around with a bigga first though, just to discover what effect it lends to the flavor and texture of a bread. I'm a beginner and have a lot to learn. I'll be book marking this page to return to, once I'm more comfortable with simplier doughs and the less complicated starters. Thanks for making this look so clear cut. 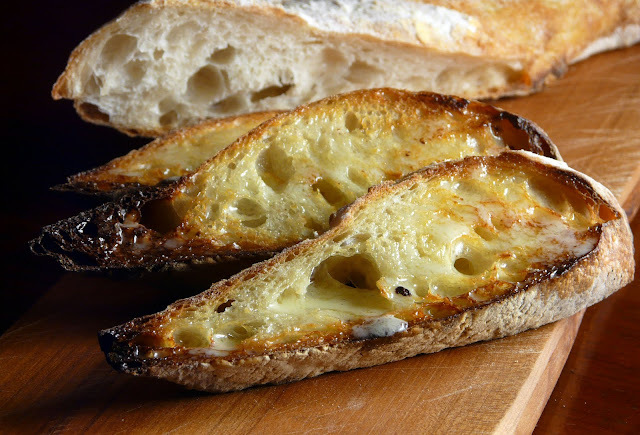 Marcela and Phoo-D, I've seen both of your breads and they look wonderful. You both know what you are doing so you won't have a problem growing your own starter. Susan, you can make a biga using 1 1/2 cups of flour, 1/2 teaspoon of yeast and 1 cup of water. Leave it to develop over night and just add it to another 4 cups of flour and 2 teaspoons of yeast. 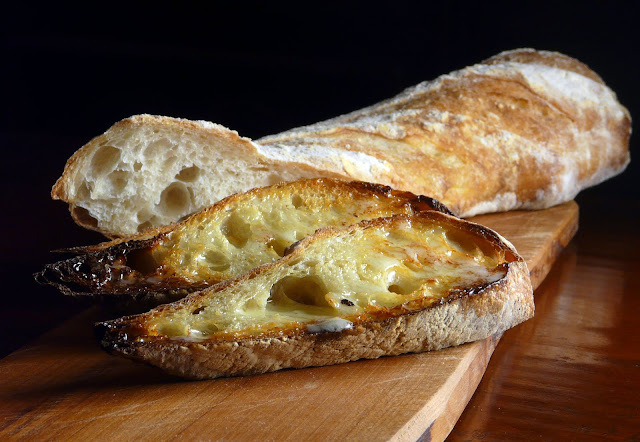 Even without the sourdough starter this biga adds to the flavour and texture of bread. Your bread photos are also masterpieces Ann. I know you say to maintain the mother starter at about 6oz. But I guess I could use a little more clarity about what to do with the starter while it's just sitting around between bread baking. And would you need to feed it often? I am new to baking so I'm clueless!!! My friends have all recommended Sourdough's International's sourdough starter to me, so I'm going to give it a go!! !